Another one from Germany now. This hefeweizen comes from the Rittmayer Brewery in the village of Hallerndorf south of Bamberg. It pours a cloudy, dark honey colour, and the aroma is heavily floral. The taste is mostly what you’d expect from a hefeweizen, where those florals take off from a wheaty base, evolving in the mouth to a slightly sour tone, which then stands out in the aftertaste. 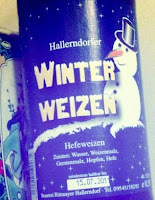 Hallerndorfer Winterweizen also has a clear banana note to it, I think. The only thing I can’t figure out is what makes a winterweizen different from a normal hefeweizen. Maybe it's just the wrong season, but I don’t really see what’s unusual or special here. I guess it’s a bit heavier in body... Is that what I’m supposed to be noticing?